The legitimacy of an initiative petition that would undo a city policy barring police from contacting or detaining individuals solely because they are suspected of being an undocumented immigrant was called into question by its opponents during a drawn-out and emotionally heated meeting of Spokane City Council Monday night. During the four-hour meeting, the council heard from the initiative's proponents, who insisted that they just want to see the nation's immigration laws upheld, and opponents, who insisted that undoing the ordinance would make immigrants less likely to cooperate with police and broadcast an unwelcoming message from Spokane to the rest of the world. The ordinance in question was adopted into city code by the council last October, codifying a 10-year-old police directive that put Spokane among dozens of cities with some sort of policy intended to steer local police away from enforcing immigration laws. The council had the options of voting the petition into law or sending it to the county to have its signatures verified and potentially placed on the November ballot. But Spokane City Council President Ben Stuckart, an opponent of the initiative, didn't like either of these options. He questioned if the initiative would violate the city charter, calling attention to one of its provisions that would require a referendum on any change to city policies or ordinances that dealt with immigration. He also took issue with a “legislative history” that supporters added to circulated petitions without the city's approval. “[I]f you're going out and collecting signatures and a biased legislative history is next to what should be non-biased [text], aren't we really in essence violating the municipal code by collecting these signatures?” he said. Councilwoman Candace Mumm recalled out-of-town signature-gatherers coming to her doorstep and presenting a petition with the “legislative history.” Mumm said she argued with the signature-gatherers for a half an hour about the legislative history. Stuckart asked Mike Piccolo, a city attorney who previously advised the council, if they had the option of not sending the signatures to the county for validation. Piccolo told Stuckart the council didn't have that option, and the legality of the initiative could only be challenged by a citizen group. 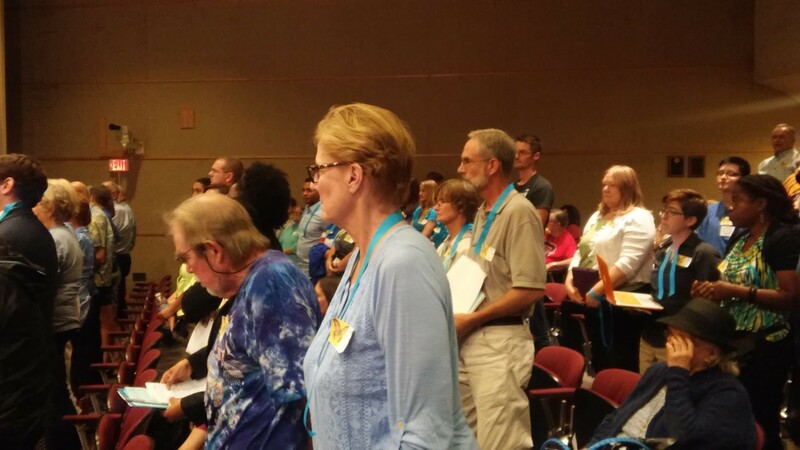 During the public comment period, the crowd that packed Council Chambers rose from their seats to show agreement with the parade of speakers appearing before the council. Rick Eichstaedt, executive director of the Center for Justice, said he opposed the initiative because the police don’t want it, and it would be costly and ineffective for them to enforce immigration law. “This petition violates the law, simply put,” he said, pointing to provisions in the city charter that prevented language not approved by the city from being added to petitions. He also alluded to a potential citizen group that was ready to challenge the petition. Lisa Logan, community education manager at the YWCA Spokane, asked the council to keep this “dangerous anti-immigrant initiative” off the ballot and to oppose it if it made the ballot. She stated that women in immigrant communities stuck in abusive relationships are hesitant to go to the police out of fear that they will be deported. This policy, she said, made them more willing to trust police. “I have to warn you that if this practice is changed, victims in our city will be killed for fear of reporting the violence against them,” she said. 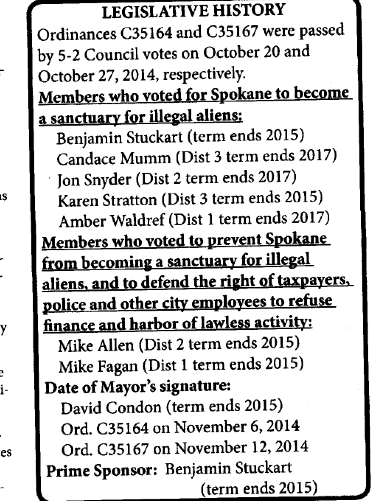 Earlier that day, Spokane Mayor David Condon said that he supported the policy. He noted that immigration matters generally falls to the federal Immigration and Customs Enforcement and called on police to provide equal services to people regardless of immigration status. “It is incumbent upon all employees of [the police] department to make a personal commitment to equal enforcement of the law and equal service to the public regardless of immigration status,” said Condon. Supporters of the initiative, who were outnumbered by opponents, pointed to a recent incident in San Francisco, which has a similar policy in place, where a woman died at the hands of an undocumented immigrant. Supporters also routinely said they weren't against immigrants or immigration, they just wanted people to do immigrate legally. Cindy Zapotocky, a supporter of the initiative, gave the city clerk a copy of Ann Coulter's recent book Adios, America. At the end of the meeting, Stuckart cited research from police organizations that supported the city's policy. He also recalled a guidance counselor at a local school approaching him and saying that a student was having trouble because his father was beating his mother and threatened to deport her if she called the police. The guidance counselor was able to have the boy's father arrested because of the policy, said Stuckart. “That's a real world story in Spokane,” said Stuckart. The council voted 4-1 (council members Amber Waldref and Mike Allen were absent) with Stuckart voting no to send the petition to the county.